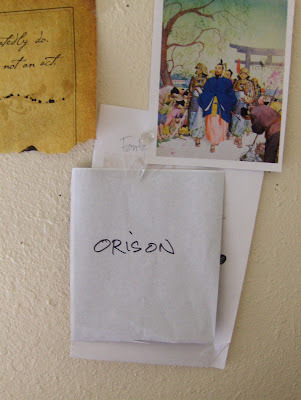 I first encountered the word “Orison” in a book of daily devotions that I use to begin my morning meditation. I had to look the word up to find out that it meant prayer. I wrote the word down, and kept it by my desk thinking it was unique and perhaps a good title for a painting. Under the watchful gaze of that scrap of paper I developed the work and concept for my current show at Darnell Fine Art in Santa Fe. Orison relates to the very essence of painting and mindfulness. Each painting is a process of directly approaching a color combination, an abstracted idea or design/decorative strategy with boldness, curiosity and an openness to a variety of results including failure. My interest in the world’s wisdom traditions, artistic history, poetry and calligraphy provide the backdrop to the direct input from daily life. Moment by moment, day by day, focused, and concentrated effort define mindfulness practice and become a method for imparting change to subconscious and overall outcome in my life and art. Walking the beaches of the south China Sea picking up chards of indigo painted white porcelain, noticing the beauty of the beat up orange patina of our local yoga studio wood floor as I practice, or finding a piece of rusty expanded metal with endless artistic possibilities as I ride a red horse across verdant alfalfa fields with my daughter under Montana’s big sky are as important to these paintings as the 1000s of hours I have spent melting, coloring and manipulating wax over the years. Watching, learning, accepting, being…how can I help but notice that it all looks and feels like an answered prayer?